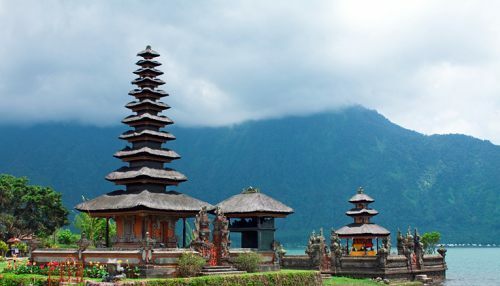 Vancouver to Bali, Indonesia (DPS) from Sep 21 to Oct 12 is bookable on the China Eastern Airlines website for $645 CAD roundtrip including taxes. This one likely won't last very long, and is possibly a mistake fare. 3. Use a departure date of Sep 21 and a return date of Oct 12.
vancouver, yvr, flight deals, asia, southeast asia, bali, denpasar, dps, indonesia and china eastern airlines. 9 Responses to "Vancouver to Bali, Indonesia - $645 CAD roundtrip including taxes | very limited dates"
Available dates are indeed very limited. I tried going China (Eng), iiHong Kong (Eng), USA, Japan, France, UK, and Australia. It seems like Canadian site has the best availability, Hong Kong, USA, Japan, UK and Australia all show a lot fewer availability or no availability at all. China and France sites weren't working on Chrome, but worked on IE. France site showed no availability at all, China site was showing a lot more expensive price than Canadian site after conversion from CNY to CAD. Google Flights and Kayak returned no such results. With such inconsistency across the globe, there may be a site or two with more available dates? Those dates on Canadian sites don't work with my vacation schedule, unfortunately. Hey guys, I can't find this deal on the site. Has anyone been able to find dates that work? I really want to buy it as soon as I find it but i'm having trouble on the site finding anything under 1000$ for roundtrip! Sounds great, but that picture definitely isn't Bali. I've been there many times and as beautiful as it is, the water in Bali doesn't look like that. I'd say that's the Maldives! Yes, agree, hard to find anything under a 1000.00 round trip. Notice the screenshot has a child ticket included of over 600.00. Does that have something to do with it? Unfortunately this one was over pretty quickly. 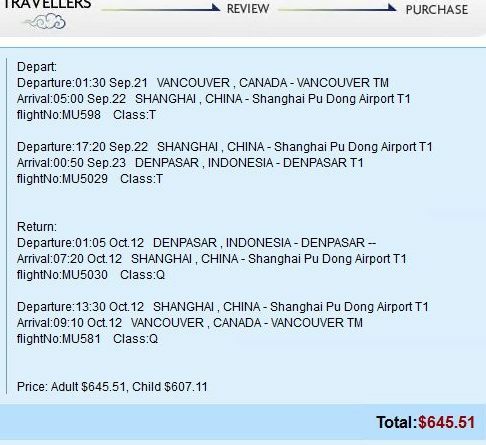 I think China Eastern temporarily forgot to include the fuel surcharges. Chachi: You're right, that was the wrong photo, it's been changed, thanks! Base fare CAD 520 + fuel, security surcharge and taxes CAD 125.91 so Total still CAD 645.91 round trip per person. 5 seats left as per posted today. Very good deal. this deal doesnt work. ive tried it several time in the past few weeks on different computers. it shows up as $700 total CAD per person 'incl taxes and everything'. you go to enter all your passport info then click to the next page to enter payment info and it jumps to $1100 per person every time. Laura: I think this deal might be long gone. It was posted back on July 21.